CRUSHER MAINTENANCE JUNE 2018 • E&MJ 71 www.e-mj.com Mine operations are also an import- ant consideration. If tramp iron is en- countered regularly, manganese steel is the best choice to avoid breakage, because harder steel and iron could crack or fail. For larger concaves, Columbia Steel also said its important to remember that by handling fewer segments, it takes less time to reline a gyratory crusher. Recognizing the value of fewer, large concave segments, they have manufac- tured double height, double width, and double height and width concaves for many mines. This approach also offers greater efficiency when ordering and replacing parts. In general, larger parts cost less per pound. There are also few- er seams, an important consideration since these are often the areas of most severe wear. In addition, fewer joints mean less backing material. Columbia Steel also explained that general-purpose con- caves with uniform thickness often wear poorly because wear is not uniform from application to application. By increasing thick- ness, they have found they can often double or triple wear life. All of Columbia Steel's concaves have side grooves for spacers or keeper dowels. Hard facing is another important consideration. Columbia Steel said it can supply Xtend wear-resistant overlays for select- ed concaves made of its H or L series steels. According to the company, mines have reported significant improvement in wear life, as much as double in some applications. So miners not only save wear metal costs, but they can also reduce changeout labor and downtime as well. Xtend can be applied to high wear areas such as under feeders, saving the changeout of an entire worn row or localized worn concaves. All marks used are trademarks and/or registered trademarks of Henkel and its affiliates in the U.S. and elsewhere. ® = registered in the U.S. Patent and Trademark Office. © 2018 Henkel Corporation. All rights reserved. 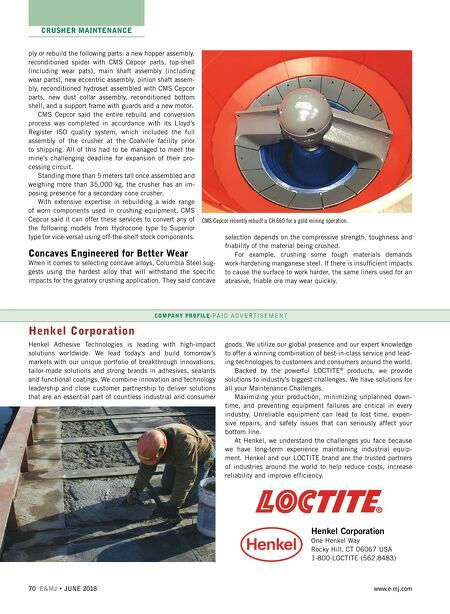 1017341 (4/18) To locate a Henkel Certified Applicator visit: www.na.henkel-adhesives.com/protectivecoatings or call 1-800-LOCTITE (562.8483) Whatever You Rebuild, Repair and Protect…. 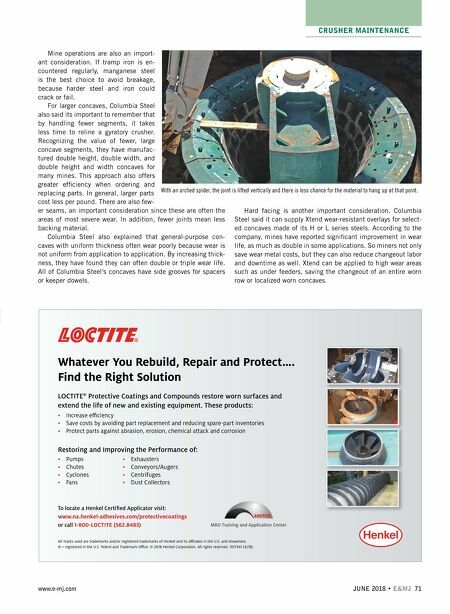 Find the Right Solution LOCTITE ® Protective Coatings and Compounds restore worn surfaces and extend the life of new and existing equipment. These products: • Increase efficiency • Save costs by avoiding part replacement and reducing spare-part inventories • Protect parts against abrasion, erosion, chemical attack and corrosion Restoring and Improving the Performance of: • Pumps • Chutes • Cyclones • Fans • Exhausters • Conveyors/Augers • Centrifuges • Dust Collectors With an arched spider, the joint is lifted vertically and there is less chance for the material to hang up at that point.